Tiger Woods withdrew from The PLAYERS Championship this weekend after only nine holes, the second time this year he has withdrawn from a golf tournament. Tiger played some horrible golf while dealing with the injury leading some to speculate that he really should not have turned up and perhaps was pressured into making an appearance. He had made the turn with a 6-over 42, before withdrawing and making a hasty exit. “Yeah, the knee acted up and then the Achilles followed after that and then the calf started cramping up. Everything started getting tight, so it’s just a whole chain reaction … I’m having a hard time walking”, Woods said after the round. Tiger has had knee injuries before but this one was only supposed to be a minor one which had resurfaced at the US Masters. He withdrew from a golf tournament only a few weeks ago on the advice of doctors in order to get the leg right for The PLAYERS Championship, and the lead up to the US Open in June. It is fast becoming a question of not just when Tiger will win again, but when will he play again? This was his second WD this year, and for a guy that has only ever withdrawn from four golf tournaments in his professional career, this is starting to get serious. But I’m slightly more worried about Woods’ headspace right now. His response to recent interviews has been nothing short of appalling. If anyone saw his post-round US Masters interview you may know what I’m talking about, and we got an equally thrilling interview prior to The PLAYERS Championship this week. 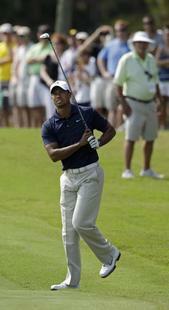 Then there was his reaction to Bubba Watson’s comments during the week that Tiger is going the wrong way. Watson just spoke his mind and gave his thoughts on Tiger’s swing. “You know, I think … yeah, I’ll just go ahead and say it. I think Tiger is going the wrong way. I think he’s so mental right now with his swing. Just go out there and play golf. He used to hit shots, used to bomb it, used to do all that stuff. In 2000 and ’97 I think he did pretty good. He won the Masters by 48 shots or whatever he won it by. Q. I know you and Bubba are friends. I was curious about your reaction to what he said last week about you going in the wrong direction. TIGER WOODS: That was interesting. Q. He said this morning that you guys haven’t had a chance to talk. Q. Do you have an issue with it? Tiger’s current swing coach got in on the act too. Commenting on Tiger is off limits now? Even if Tiger’s headspace is not so good now, I’m not so sure these sort of comments from his entourage are going to help. Tiger Woods is possibly the greatest golfer ever to have played the game, and when his golf becomes less than great, everyone is going to talk about it. Including other players. Tiger looks like he has some physical injuries to deal with but he is also going to have to deal with criticism, advice or even just plain old comments until he wins again.